Who is baseball's best manager? 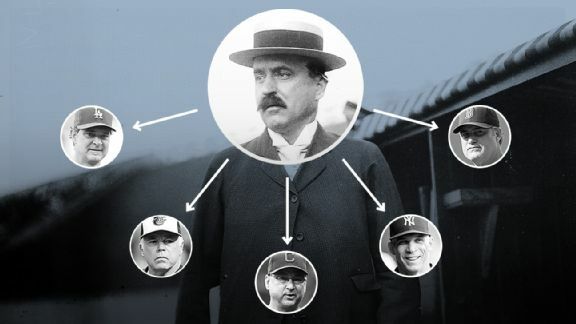 If you subscribe to the notion that smart, analytically savvy front offices determine a team's success and the manager is little more than an appendage clad in cap and spikes, chances are you haven't spent much time following the National League West. None of Stewart's peers would ever endorse team-on-skipper crime as a way of leveling the playing field. But they're almost universally in accord with his scouting report. ESPN.com surveyed 50 scouts, front-office executives, big league coaches and media analysts and asked them to select the game's best managers in a multitude of categories. The overall winner: Bochy, whose three world championships in five seasons have put him on a Hall of Fame track and raised him above the crowd. Given the rampant turnover in the profession -- four skippers have already been fired or resigned this season -- many managers are still settling into the job and need time to build their résumés. Paul Molitor has the Minnesota Twins playing unexpectedly well in his first year on the job, and Jeff Banister has made a big early impression in Texas. And Detroit's Brad Ausmus, Houston's A.J. Hinch and Tampa Bay's Kevin Cash are among the young managers with all the attributes to achieve long-term success. Interestingly enough, former San Diego manager Bud Black also polled well in multiple categories before the Padres pulled the plug on him two weeks ago. He remains part of the voting even though he's no longer employed. Sure, Bochy has had the luxury of working with such talented pitchers as Matt Cain, Madison Bumgarner and Tim Lincecum during his tenure with the Giants. But he rarely pulls a pitcher too early or stays with him too long, and he also knows when to back off during a long season. Several of Bochy's bullpen staples -- e.g. Santiago Casilla, Jeremy Affeldt and Javier Lopez -- achieved more success in San Francisco than during any other career stops. And Bochy's signature decision, to let it ride with Bumgarner for five innings in Game 7 of the World Series, reflects his ability to go with his gut and make the right call on the biggest stage. As several survey participants pointed out, Bochy has one of the best pitching coaches in baseball in Dave Righetti, who has played an enormous, and at times, unheralded role in the franchise's success. Showalter is regarded as a master at running the bullpen, in part because of his farsightedness and restraint over a 162-game season. Like Jim Leyland, he's not afraid to lose a game today if it means keeping an important arm fresh for the long haul. Joe Sheehan, a longtime baseball analyst and founding member of Baseball Prospectus, calls Showalter "the best X's and O's manager since Davey Johnson,'' and most survey respondents agreed. Showalter's success stems in large part from his obsessive attention to detail. How many managers take the time to read the biographies of umpires or study up on their ball-strike calling tendencies before every game? Showalter is constantly thinking several innings or even days ahead, and if he makes a move that doesn't work, it won't be because he hasn't weighed all the ramifications beforehand. Francona's ability to monitor the pulse of his clubhouse and keep the players engaged is a tribute to his personality and his priorities. He's a master at self-deprecation, and he rarely misses an opportunity to poke fun at himself for his lack of hair, or his prominent nose, or his 10-year playing career as one of the last guys off the bench. He takes his job very seriously. But he doesn't take himself too seriously, and his common touch resonates with his players. "Your stars are your stars,'' said an AL personnel exec. "What do you need to tell Evan Longoria -- go out and get three hits today and win the game for us? It's those five guys on the end of the bench who make the difference in the clubhouse. If they're griping and bitching about playing time and everything else, that kind of permeates the clubhouse. If you can figure out a way to keep them involved, you're doing a pretty good job." National League managers typically stand out in this category because the absence of the DH affords so much more opportunity to use a bench. So Showalter's presence at the top of the list is a testament to his ability to get the most out of back-end-of-the-roster guys. Showalter has gotten a lot of mileage out of players like Robert Andino, Ryan Flaherty, Delmon Young, Steve Pearce and Jimmy Paredes in Baltimore in recent years. The managers deemed best in this category had undistinguished playing résumés, to various degrees. Maddon never played above Class A ball, while Showalter topped out in Triple-A with the Yankees' organization. Bochy hit .239 over nine seasons as a backup catcher with San Diego, Houston and the Mets, while Melvin hit .233 as a reserve catcher for San Francisco, Boston and five other clubs. Hurdle broke in as a Sports Illustrated cover boy in Kansas City, but got a big dose of humble over 10 seasons as a backup player. They all know what it's like to be overlooked or an "extra'' guy. Creativity can manifest itself in a lot of ways, and Maddon ran the gamut during his nine seasons in Tampa Bay. He was into defensive shifts before they became common practice, and he wasn't afraid to go with two outfielders and five infielders in late-game situations. He took a page from the Don Zimmer playbook and made the safety squeeze a staple of his offense with runners on first and third, and bucked conventional wisdom by hitting Evan Longoria, Matt Joyce and Carlos Pena in the leadoff spot to help extricate them from slumps. Maddon thought batting practice was overrated and conceived the idea of "American Legion week'' in late August. Players would arrive at the park a couple of hours before game time and just went out and played -- the same way they did in Legion ball. His idea of a dress code was, "If you think you look hot, wear it.'' And the "theme road trip'' was a staple of his regime. The Rays and their spouses wore pajamas on one charter flight, and the players dressed up like Johnny Cash, the Beach Boys and Urban Cowboys during other trips. On any given day, the Tampa players would walk into the clubhouse and find a merengue band, a pair of penguins or a 20-foot python in their midst to help lighten the mood. Lo and behold, when the Cubs pulled into New York this week with a five-game losing streak, Maddon invited Simon the magician into the clubhouse to help ease the emotional burden. No, it's not the most important aspect of a manager's job. But it consumes a lot of time, and it's the primary vehicle through which a manager explains decisions and interacts with fans. In this category, we surveyed a dozen national baseball writers and media personalities for their takes. The most valued attributes for managers included: accessibility, quotability, an even temperament, a thick skin, a sense of humor and the patience to explain in-game moves. Managers routinely have to strike a balance between candor and protecting their players, amid pressure from above not to share too much information with the press. It can be a delicate balancing act. The following managers all received multiple mentions for their media-friendliness: Maddon, Showalter, Francona, Terry Collins, Fredi Gonzalez, Black, John Gibbons, Clint Hurdle, Bob Melvin and Don Mattingly. Others who received mentions: Lloyd McClendon, Robin Ventura, Bochy, Ausmus, Farrell and Hinch. USA Today's Bob Nightengale on Clint Hurdle: "It's like interviewing a motivational speaker. You walk away feeling better about yourself." The common denominator among these guys: As the tension mounts, they find a way to lower the temperature and remind the players that the world isn't about to end just because they lost a game today. Of course, it helps that the more established managers have a lot of money in the bank and don't have to deal with the daily speculation that they might be fired. Hurdle is an interesting case. He has an outsized personality, and he's fond of homilies and inspirational sayings that he dispenses in a daily email missive. It's natural to wonder if he might wear out a clubhouse over time, but a veteran AL scout insists that he's genuine.